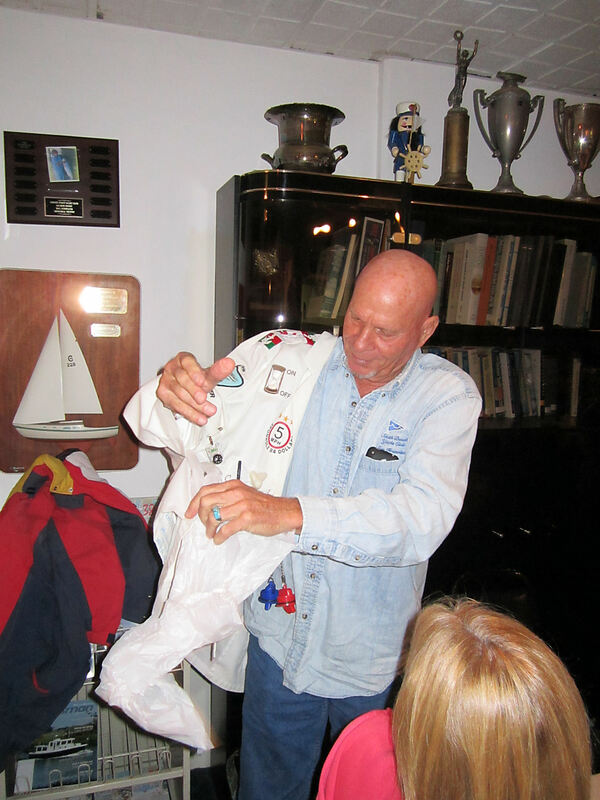 The Event: Last Wednesday during dinner at the Coyote Point Yacht Club Beer Can Races, Gil McCoy was awarded the infamous White Jacket. Present at the dinner were many CPYC members, power boaters from the Dos Rios Yacht Club cruise-in and a large number of Beer Can guests. The place was packed. The Offense: While river rafting a couple of months ago, Gil, who was not wearing a helmet, ignored warnings to duck his head. Subsequently he suffered lacerations to the back of his head either from bashing it on rocks or dragging it through some very thick, prickly and tough bushes on the shore. There was some blood and pain and this was sufficient to elicit appropriate sympathy from the several nurses who were on board the raft. No stitches were needed for the injuries. Gil was observed the next day sitting at the CPYC bar with five or six bandages taped to the back of his head. Witnesses: CPYC members Doris Borg and Sue Zweig were present and witnessed the offense. The Presentation: John and Lois Watson (the then current recipient of the White Jacket) were unable to attend the presentation so an ad-hoc version was performed. An official presentation more conforming to the traditional rules will be performed at a later date. Everyone had a great deal of fun and it was absolutely entertaining. It was the highlight of the evening. I gave a brief description of the White Jacket and Doris Borg, a Witness, made the actual presentation. Everybody gave a large round of applause to celebrate Gil’s misdeed. I am sure some of the CPYC members present were muttering under their breath “better him than me”. 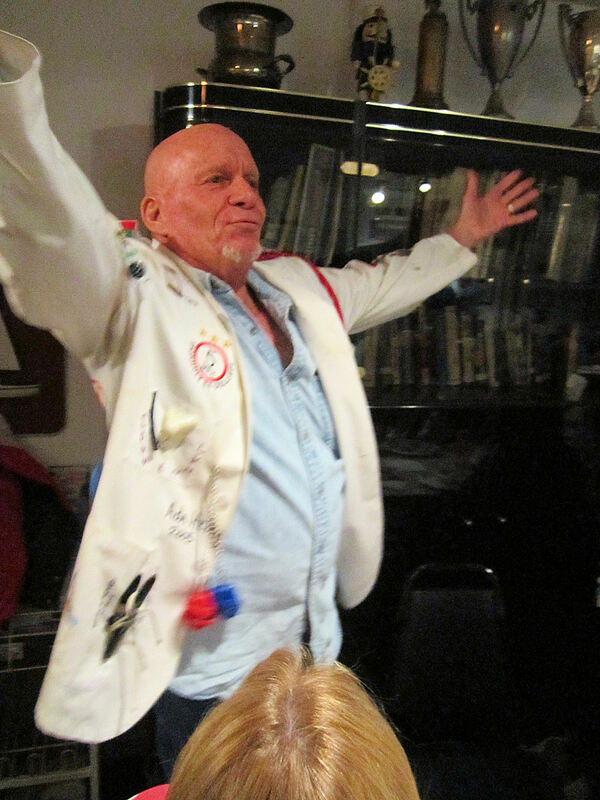 The Recipient’s Reaction: Gil was rather pleased to be awarded the White Jacket and for the second time. The next day he wore it to his Toastmasters meeting and told the story about the jacket and how he got it. This is good promotion for our club. I am sure Gil will wear it every chance he gets as he certainly enjoys the attention. Gil was overheard “I hope to keep it for a month or two”. I hope so too. 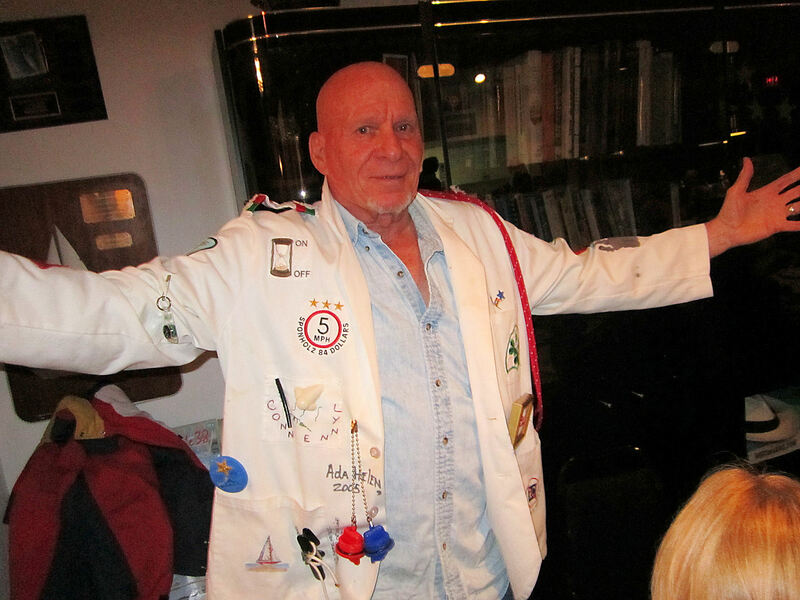 Background: The White Jacket: Created by member Jerry MacKay, the White Jacket is awarded to CPYC member skippers who commit boating offences of varying severity of almost any sort. It is also known as the “CPYC ICEMAN” jacket since in Jerry’s days as a US Navy aviator, the pilot who messed up typically took the heat off all the others and this was clearly appreciated. This is the origin of the CPYC White Jacket. Traditionally the recipient attaches a small trinket depicting the offense on the jacket. There is no official list of these trinkets and the attending offenses. They are contained only in traditional CPYC aural folklore so many stories, urban legends and embellishments are possible. Recipients usually make these trinkets somewhat cryptic and creative to provide some small amount of anonymity and increase the curiosity value and aura of the jacket. People naturally start friendly discussions about who each trinket is from and what offense it represents when the jacket is worn by the current hapless recipient. The said member is required to wear it to all official CPYC functions. All other display times are optional yet very appreciated. There are many, many members who have deserved the jacket in the past but have managed to escape detection and/or prosecution for a multitude of reasons. Recipients are generally regarded as being very good sports. Gil’s Trinket Contribution: You will have to ask Gil about this. You could also try asking Doris. Conclusion: The White Jacket never fails to create interest and entertainment whenever it surfaces and this was certainly true that night. Quite a few people who had never heard of or seen it were quite impressed. There was an unsubstantiated rumour that on this particular night, a far more serious offense was committed whereby a Beer Can guest (a power boater from Dos Rios YC) was allegedly hurled off a member’s sailboat into the water and successfully rescued. With no photographic proof existing and the fact Gil and everyone else were having so much fun, attention was thankfully diverted from this alleged incident. It probably helped that the one potential member witness had to leave the dinner early and was therefore unable to sufficiently press the issue at that time.